Les Habitants! On y va! After some careful consideration, I've come to the conclusion that Habs fans are some of the most manic-depressive fans in all of sports. After the untimely injury of Carey Price, so many of us started talking about being swept by New York. Now, after a nail-biting win in overtime of game 3, there's once again talk of planning the Stanley Cup parade. And while they're still down 2-1, I think some of the optimism is justified. Tokarski may not be Price, but he's doing a pretty good imitation (e.g. his brilliant stop vs. Marty). Therrien's decision to start the young rookie in net was met by a lot of criticism, but once again he's proven himself to be a skilled tactician. If Dusty can maintain the level of play he showed in game 3, the Habs have a real fighting chance against the Rags. 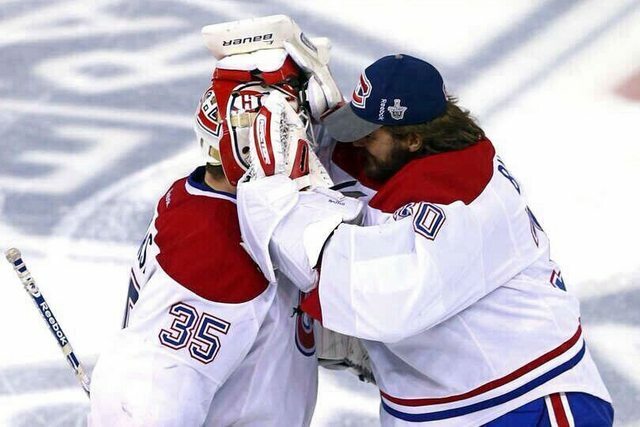 While I think it's obvious now that starting Tokarski was the right move, it's still hard not to feel for Peter Budaj. Being passed over in a clutch situation is never easy. That being said, he is the epitome of a team player. Here he is with Tokarski after game 3, with no ill will and doing everything he can to help support the kid between the pipes. As much as I hate the C-word, that's pure class. So maybe it's a little (or a lot) to early too talk about the cup, but let's not pretend we're out of this series yet. Go Habs Go!